Turrid shells. family Turridae. Turrids are found in all seas around the world. They have been found in both deep water and intertidal zones. Most species have a tall spire and long siphonal canal. All Turrids have a long or short slit or notch at the upper end of the outer lip. Turrids vary in size from less than 1/4 inch to 5 inches. The operculum is leaf shaped. Turrids prey on marine worms. Turris shell or Indian Turrid. family: Turidae. 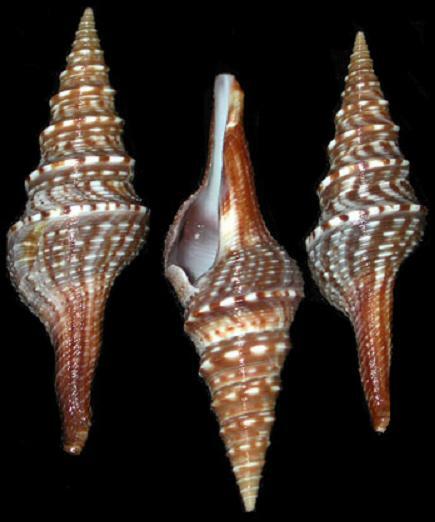 The Turris or Indian Turrid is a many whorled shell. The spire is longer than its siphonal canal. It has a narrow notch towards the upper end of the outer lip. The columella ends in a long sinuous canal. All whorls are sharply keeled. The shell is white with brown streaks. Indian Turrid is one of the largest turrids. They are found in sandy shallow seas; across the Indo_Pacific region.